The Best Fashion Technology blogs from thousands of top Fashion Technology blogs in our index using search and social metrics. Data will be refreshed once a week. Los Angeles, CA About Blog TechLovesStyle is an award-winning style blog by Yarina Yao, featuring technology related fashion & beauty. Facebook fans 2,563. Twitter followers 2,562. San Francisco, CA About Blog Welcome to Techwear Clothing! This is a community for any and all things related to techwear fashion. Facebook fans 1,187,943. Twitter followers 545,936. New York, NY About Blog Glossy in a new publication from Digiday Media that covers how technology is modernizing the fashion and luxury industries. Facebook fans 13,165. Twitter followers 6,457. London About Blog Escalating the adoption of wearables by translating technology with a fashion voice. Facebook fans 1,223. Twitter followers 64,806. Worldwide About Blog Decoded Fashion is the top global event series connecting decision-makers in Fashion, Beauty and Retail with emerging and established technology companies. Facebook fans n/a. Twitter followers 13,969. About Blog I established this blog to document the transition and expansion from 2D traditional to 2D Digital to 3D virtual for apparel textile product design, development and retailing. Global About Blog Dedicated since 2005 to building a bridge between fashion & technology. Facebook fans 5,691. Twitter followers 7,173. Silicon Alley, New York About Blog New York, Fashion, Tech,Travel. Blogging and Social Media Tips. Facebook fans 11,700. Twitter followers 2,497. Worldwide About Blog Fashion tech blog dedicated to fit technology, retail technology, bespoke and all things related. Facebook fans 302. Twitter followers 170. About Blog Covering fab trends in fashion tech. 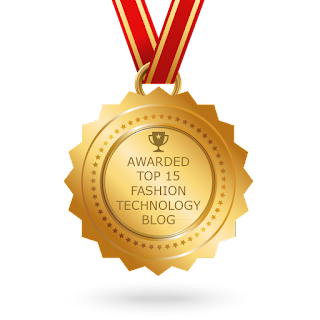 CONGRATULATIONS to every blogger that has made this Top Fashion Technology Blogs list! This is the most comprehensive list of best Fashion Technology blogs on the internet and I’m honoured to have you as part of this! I personally give you a high-five and want to thank you for your contribution to this world.